Up the sidewalk to the imposing Victorian mansion at 2007 Franklin Street — the historic Haas-Lilienthal House — walks a group of senior travelers who call themselves road scholars. They are greeted by a gentleman in a vested suit and bowler hat, carrying a silver-headed cane, who welcomes them inside. It’s not John Gaul’s home, although sometimes people think it is. From a passing car comes a shout: “Hey, are you Mr. Lilienthal?” He bows ever so elegantly and welcomes his visitors inside. 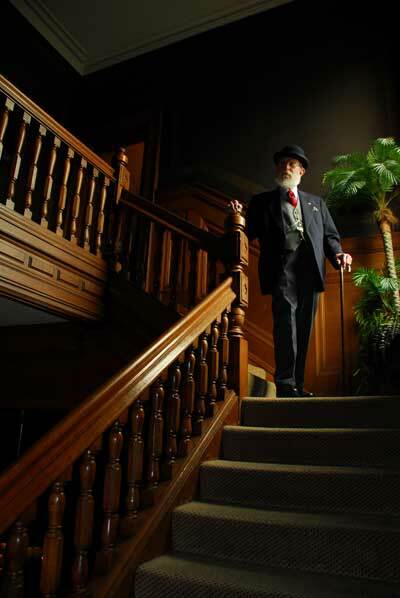 For more than a decade, Gaul has been one of about 50 docents who lead tours of the Haas-Lilienthal House, which was donated by descendants of some of the city’s most prominent families as a home for San Francisco Architectural Heritage, the historic preservation group. Heritage offers one-hour tours on Wednesdays, Saturdays and Sundays. Docents guide visitors through the perfectly preserved wood-paneled rooms, most still with the original furnishings. They explain the distinctiveness of Victorian architecture and the privileged lives of the family that lived in the house from 1886, when it was built, until 1973. WELCOMING NEW DOCENTS: Now Heritage is inviting new docents to join its ranks. A training program begins March 13 at 6 p.m. and includes eight sessions of lectures by historians and architects, plus tips from seasoned docents, including Gaul. To learn more about becoming a docent at the Haas-Lilienthal House, contact volunteer coordinator Dorothy Boylan at 441-3000 ext. 24.